"Ultimately Dumbo is about overcoming obstacles and relationships both human and animal and is entertaining enough"
Dumbo 2019 is a reimagining of the classic 1941 animation from Disney. This being a live action feature film utilising CGI elephants, including the titular character Dumbo to convey a different take on the previous film with occasional nods and references to the original. With the introduction of a new plot and the addition of several new characters the film is fleshed out, however the core element of the film is retained with Dumbo being born with large ears, discovering his ability to fly and also being separated from his mother. The Medici Brothers Circus is a small struggling traveling Circus owned by Max Medici play by Danny DeVito. Here we find that one of the elephants has given birth to a baby elephant with very large ears, who later through ridicule because of his ears and demeanour is named Dumbo, at first an insult, but then affectionately. Previous employee and returning WW1 hero Holt Farrier played by Colin Farrell and his children Milly and Joe (played by Nico Parker and Finley Hobbins respectively) are charged with training and looking after Dumbo. The later being more necessary after Dumbo's mother is sold to meet costs at the circus. Whilst looking after and playing with Dumbo the children see him inhale a feather through his trunk, sneeze and momentarily fly by flapping his ears. Later his full flying abilities are witnessed by a full paying crowd at The Medici Brothers Circus, news of which reaches far and wide. Including to one V. A. Vandevere an opportunist entrepreneur played by Michael Keaton the owner of the Dreamland Circus resort. A semi-futuristic leisure complex built to a grand scale. 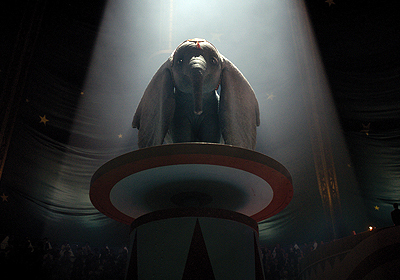 Keaton's character V. A. Vandevere hopes to acquire Dumbo for Dreamland to build upon his empire. He's accompanied on his pursuit by French trapeze artist Colette Marchant played by an under-utilised Eva Green. Ultimately Dumbo is about overcoming obstacles and relationships both human and animal and is entertaining enough, this version of Dumbo fails to capture the magic of the original animation and neither does it benefit from the direction of Tim Burton and the reimagined story line. Even though this is one of the better films that Tim Burton has made in recent years the result is just an average film that is watchable enough, but ultimately it's quite forgettable earning itself two and half stars.